Chemical reactions take place around us all the time—in the air we breathe, the water we drink, and in the factories that make products we use in everyday life. And those reactions are unexpectedly fast. Given optimal conditions, molecules can react with each other in a quadrillionth of a second. Industry is constantly striving to achieve faster and better chemical processes. Producing hydrogen, which requires splitting water molecules, is one example. In order to improve the processes, researchers need to know how different molecules react with each other and what triggers the reactions. Computer simulations can make it possible to study what happens during a quadrillionth of a second, so if the sequence of a chemical reaction is known, or if the triggers that initiate the reaction occur frequently, the steps of the reaction can be studied. But this is often not the case in practice. Molecular reactions frequently behave differently. Optimal conditions are often not present, like with water molecules used in hydrogen production, and this makes reactions challenging to investigate, even with computer simulations. Until recently, scientists haven't known what initiates the splitting of water molecules. However, it is known that a water molecule has a lifespan of 10 hours before it splits. Ten hours may not sound like a long time, but compared to the molecular time scale—a quadrillionth of a second—it's quite long. This makes it super-challenging to determine the mechanism that causes water molecules to divide. It's like looking for a needle in a haystack. NTNU researchers have recently found a way to identify that needle in the haystack. In their study, they combined two techniques that had not previously been used together. They studied almost 100,000 simulation images of this type before they were able to identify what triggers the water molecules to split. Lots of computing power went into those simulations. 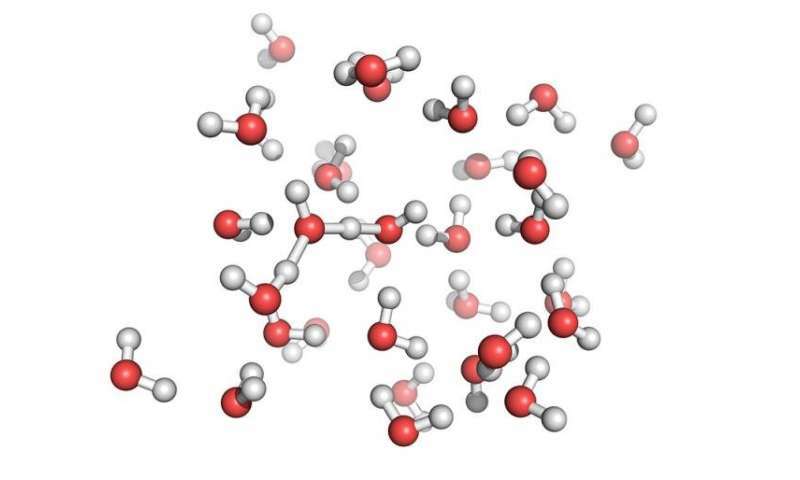 By using their special method, the researchers managed to simulate exactly how water molecules split. "We started looking at these 10,000 simulation films and analysing them manually, trying to find the reason that water molecules split," says researcher Anders Lervik at NTNU's Department of Chemistry. He carried out his work with Professor Titus van Erp. "After spending a lot of time studying these simulation films, we found some interesting relationships, but we also realized that the amount of data was too massive to investigate everything manually." The researchers used a machine learning method to discover the causes that trigger the reaction. This method has never been used for simulations of this type. Through this analysis, they discovered a small number of variables that describe what initiates the reactions. What they found provides detailed knowledge of the causative mechanism, as well as ideas to improve the process. Finding ways for industrial chemical reactions to happen faster and more efficiently has taken a significant step forward with this research. It offers great potential for improving hydrogen production. uh, so what did they find? this is a classic feeling of an incomplete description of a piece of research. "Based on the analysis of thousands of molecular trajectories, we identified a couple of local order parameters and show that if a [OH] bond stretch occurs when all these parameters are around their ideal range, the chance for the first dissociation step (double-proton jump) increases from 10^−7 to 0.4. Understanding these initiation triggers might ultimately allow the steering of chemical reactions."